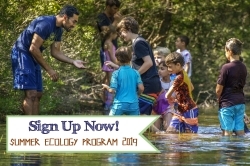 Long Island summer camps, Long Island day camps, summer camps on LI, Long Island summer events, summer fairs, summer festivals, summer children's activities, Long Island, LI, New York, NY. 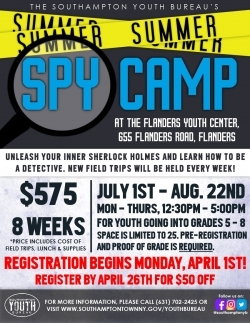 Southampton Youth Bureau 2019 Summer Spy Camp - Registration Open at Flanders Youth Center in Flanders, Suffolk County, Long Island, New York. Join us at our open house to tour our beautiful 18-acre campus, learn about camp programs, meet with directors and key staff all while taking advantage of summer registration savings! 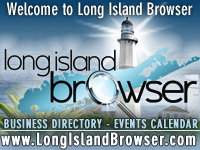 Tags: Long Island summer camps, Long Island day camps, summer camps on LI, Long Island summer events, summer fairs, summer festivals, summer children's activities, Long Island, LI, New York, NY.